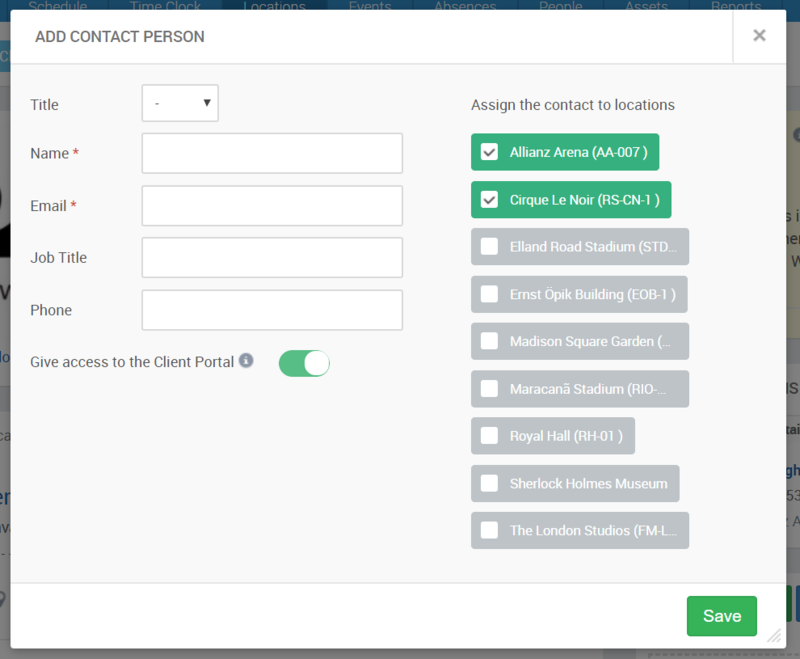 You can add several contact persons for a client - we highly encourage you to do this - if you can't reach the main contact person for whatever reason, it would be great to have another one just in case. To view and add contact persons, go to the client's profile by clicking on their name in the Clients list under Locations tab. The Contact Persons sections is on the right side of the page below Internal Notes and will display the name, position, company and contact information for the person. 1. Click on the green "Add" button in the top right corner of the section. This will open a pop up window. 2. Fill in all the information about your new contact person. The new person should now show up in the Contact Persons section. If you wish to update a person's information, click on their name. To delete a contact person from the list, click on the little cross on the right hand side of their section.